* and in September will be having a solo exhibit at Modern Art, Inc. in London...which i am sure will be an amazing show. All of which is great to hear, of course! At Bransten, ... By Area painter Jessica snow['s ...] work shows how quantity can determine quality in painting. Snow's paintings have the meandering, episodic quality of her occasional installation pieces. Abstractions that evoke maps and micro-cityscapes and circuitry, they suggest a mind flitting among fixations -- on a color here, a shape, texture or technique there. "Further Shore of Yesterday" (2005) though the most poised work on view, suggests something made by Joan Miro on speed. In her second solo show at the gallery, San Francisco Artist Jessica Snow continues to blend amorphous shapes in cool colors with more geometric areas suggesting aerial views or maps. Her use and application of carefully selected contrasting pigments help determine the boundaries within each composition. Thinly applied washes of acrylic paint make up the bulk of the irregular areas while the "urban" areas are described by heavily textured spurts, dabs, and strokes of oil paint. While the larger paintings reference aerial views and Platt maps, that include water-ways, streets and interstates, open space, and urban clusters, Snow's exhibit will also include small works on paper and ink-jet prints that have a tighter focus on the details found in the larger pieces. In all the works, however, one is aware of Snow's successful attempts too merge abstract and "real" elements into a harmonious blend that expands the meanings and possibilities of both. Snow received her Master of Fine Art at Mills College in Oakland and was a recipient of a San Francisco Art Council Award Grant. Since her last solo show at Rena Bransten Gallery, Snow has had a solo exhibition at the Riverside Art Museum in Riverside, California; she was also recently included in Neo Mod: Recent Northern California Abstraction at the Crocker Art Museum in Sacramento, and Observations at the Carl Berg Gallery in Los Angeles. Hope everyone is well and enjoying their spring! I just wanted to let you know about a crafty sale that I am participating in. (for those of you who didn’t know – a studio mate and I have started producing limited edition hand silk-screened t-shirts and bags for women and babies – men’s shirts are on the way....) It should be a really fun sale. One of the highlights of my 2001 residency at the Helene Wurlitzer Foundation of New Mexico was meeting Montreal-based artist Scott MacLeod. It was great seeing him make these Taos-inspired paintings. In my journal, he made drawings (one of them of a "Gotland Grave") related to his "Ancestral Homes" series; I was really pleased to hear later that his series were exhibited in 2002 at the Swedish American Museum Center in Chicago). I really love this series as it's narrative-laden while also working effectively as purely visual (even abstract) imagery. Congrats to Scott MacLeod who's exhibiting in the following exhibitions. Take Campus Drive East to Campus Drive West about a mile and a half to Searsville which is the first street after Stock Farm. You can only make a right. Drive down about 1/4 mile and you will see an unmarked driveway on the right ( 173 Searsville-it's the first driveway that is not gated). Drive down all the way in until you see the courtyard with the huge oak tree. Theresa Chong inaugurates a new web site. Check it out -- it's lovely! These works were sent by Emmy Catedral, a talented young artist in New York City who's been doing some fabulous works based on exploring the impure margins, including said margins of the ubiquitous yellow legal pads! Fabulous perspective! 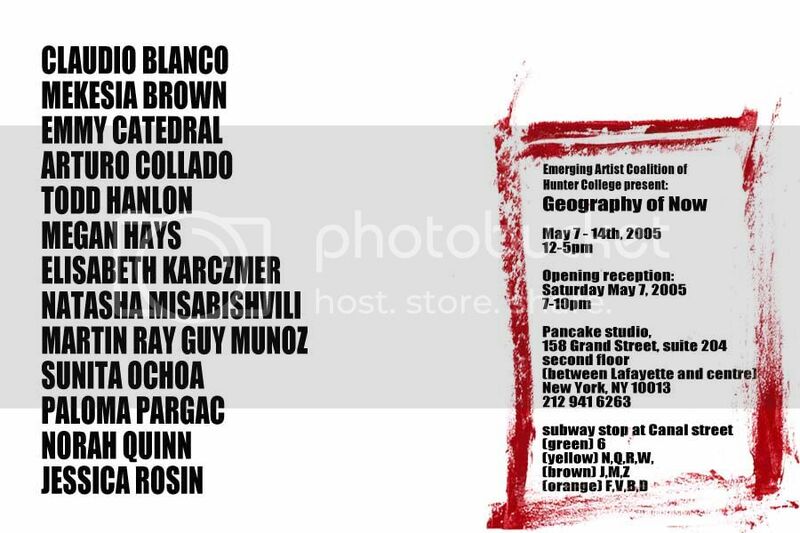 The Emerging Artists Coalition of Hunter College presents "The Geography of Now", opening Saturday May 7, 2005 at 7 pm. Examining the theme of the urban experience distinctive to New York City, the artists of the Emerging Artists Coalition of Hunter College respond to the ideas of personal space, environmental imprint and impact, landscape and topography. The intention of "The Geography of Now" is to synthesize concept and construction from the individual perspectives of the thirteen contributing artists' particular relationships to the city. Stephanie Syjuco, the Mail Order Brides (a performance art group comprised of Reanne Estrada, Eliza Barrios and Jenifer Wolford), Reanne Estrada, and Eliza O. Barrios are among the artists featured in this groundbreaking new book, Pinay Power: Peminist Critical Theory, edited by Melinda L. de Jesus, which is the first collection of peminist (Filipina American feminist) cultural criticism by and about Filipina Americans. Works of art from this eclectic group of Filipina American artists will grace Kimmel Center's Commuter Gallery to complete an ethereal transformation and usher the viewer into the Spirit of the Babaylan, its different dimensions in contrast with the realities of being a woman and an ancient spiritual and cultural legacy unique of those who know the Philippines as Motherland. The Kimmel Center Commuter Gallery, located on the second floor of the Helen and Martin Kimmel Center for University Life, New York University's new hub of campus activity for undergraduate students, graduate students, faculty, staff and alumni, overlooks Washington Square Park in the heart of Manhattan's Greenwich Village. Gallery Hours: Monday - Friday 8 a.m. - 8 p.m. Weekend hours are to be announced. The Spirit of the Babaylan: Open Art Exhibit is free to the public. Alfredo P. Alcala, Christian Voltar Alcala, Terry Acebo-Davis, Melissa Nolledo-Christoffels, Mel Vera Cruz, Ben Lagasca, Anthony Cruz Legarda, Norma Nuyles Robinson, Manuel Rodriguez, and Lizanne Uychaco. The works of Angelo Baldemor, Manuel Baldemor, Norma Belleza and A. Celis will also be shown. As a board member of several community organizations such as Asian Council and the Philippine American Chamber of Commerce of Oregon (PACCO), Melissa believes passionately in promoting cultural diversity. She’s a photojournalist for Manila Bulletin-USA and staff writer of the Asians in America Project. Her work has graced magazines, literary ezines and book covers and has been part of several exhibitions on both the east and west coasts. Born in Manila to writers Blanca Datuin and the late Wilfrido Nolledo, she was raised both in the United States and the Philippines. She now resides in Eugene, Oregon with her husband and three children and recently joined the staff of the Center for Educational Policy Research at the University of Oregon. Stephanie Syjuco's latest works illustrate why I think she is among the most brilliant artists of her generation (she's in her thirties). In fact, her particular projects as related to her reconfiguration of the modernist International Style as well as "Black Market" relate to my Shopping Project -- and are likely to form one of the "Installments" that I'll be juxtaposing against my current shopping lists. Do click here for info on her exhibit, though I'll excerpt some relevant paragraphs below about her conceptual underpinnings. La Maison Tunisie (After Perriand) is a resuscitation of a modernist shelving unit by French designer Charlotte Perriand, a colleague of Le Corbusier–but executed in cardboard, paper, glue, and tape. Built using the same conceptual strategy as one would build a shanty (with whatever’s at hand ), I’ve tried to pull together the history of style, place, and social space, and to implicate the layers of translations at work on both the “original” and the “cover.” My memories of the Philippines include crumbling architecture in the International Style, of which Perriand was a student. Indeed, that style went international– to the Third World–and aged into a dated design physically manifesting the weight of reality and time (even humanity) coming to bear on the modernist vision of progress. Untitled (After Perriand) is made entirely from papier-maché; with the weight on top pulling downwards like the weight of history. Black Market uses altered tourist photos of the Philippines downloaded from the internet, as well as sculptural reconfigurations of commodities. I digitally “blacked out” commodities from marketplace images—mainly the produce, foodstuffs, and other commonly traded items in villages. In thinking on the global control of goods and capital exercised by multi-national corporations, I began to speculate that the term “black market” could not only come to refer to knock-off or imitation goods, but to any item being sold or produced which falls outside of the “sanctioned” channels of capitalism. The term itself conjures up images of contraband weapons, drugs, illegal merchandise, human trafficking, and shady backroom deals. What if produce and local handicrafts were seen to be just as dangerous? This May, Kearny Street Workshop presents a new multimedia visual exploration, Pirated: a post asian perspective, featuring work by Bay Area artists STEPHANIE SYJUCO, KATHY AOKI, DONNA KEIKO OZAWA, CURTIS CHOY, INDIGO SOM, MICHAEL ARCEGA, GLORIA G. GALANG, SCOTT TSUCHITANI, MEL VERA CRUZ, THUY TRAN, and DEREK CHUNG. Can piracy be justified in certain contexts? How is it used to seize and amass wealth and power, and how can it be used in resistance? The work presented here unearths alternative definitions, while also using piracy as a vehicle to question the rights of property and ownership, of both the material and abstract. In expanding upon the definition of piracy-and more significantly, in identifying , exposing and resisting acts of theft and unauthorized appropriation, each of these artists participates in a distinctly political and powerful act -- seizing her own power, and engaging in a wholly different and illuminating form of piracy.